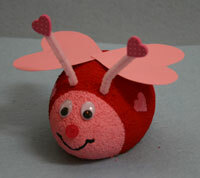 Give these little love bugs to all of your favorite valentines this year. His cute little face is sure to make them smile! adorable!!!! will have lots of fun making this!! !